New York Comic Con has come and gone and what a grand time it was! First and foremost I would like to thank everyone who stopped by my table and said hello and even more thank you to the kind and wonderful people who supported my work. You make the continued art creation possible with your support. 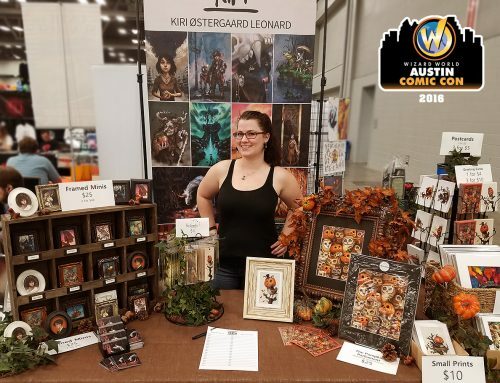 This is the third year I have exhibited in the Artist’s Alley and it was an absolute blast. My favorite part was reconnecting with people that I met the previous years. It’s always nice to see familiar faces and even more so when they’re excited to see what new artwork you have brought! Fans and repeat customers are wonderful – these are your bread and butter so make sure to reward them. There are multiple ways to reward your fans and loyal customers, you can offer them discounts, free prints or postcards, coupons or something else. Let them know they’re special to you! Alex and Alana! It always makes my con better when these two stop by my table. Have a mailing list sign up at your table. Mailing lists are great for your illustration business because people who put willingly sign up for your newsletter, are people who are genuinely interested in hearing more about your work, these are the exact people you want to connect with as an artist so get started on that mailing list. If you make eye contact with people as they walk by they are much more likely to take interest in you and stop at your table. Conventions are packed with people and art so do your best to be personable and give out a positive vibe. Eye contact and smile until your cheeks get sore! Raffles or Giveaways are a good way to intrigue newcomers. This year I had a raffle at my table and it was really successful. Not only did it give people an incentive to sign up for the mailing list, it also spurred great conversations and it felt great to give a huge scaled print away to someone who really appreciated it. On that note make sure whatever you are giving away is actually something of value and interest. Don’t giveaway poor quality prints. Make it something special! It reflects better on you. Here is Allison who won my big print raffle! Practice your elevator pitch beforehand and practice speaking about your art. There are going to be a lot of people asking about the inspiration, thoughts, feelings and stories behind your work, so make sure you have this well thought out beforehand. When you encounter prospective clients you also want to have your elevator pitch ready. Make an effort to connect with and befriend other artists. Some of the best friends I have are artists and some of the best jobs I have had has been because of friendships with other artists. It’s just worthwhile, there are so much you can learn from one another and it’s always wonderful to connect with someone who understands your passion. Myself and yy dear friend and convention companion Betsy Peterschmidt. Not all value is in sales. Sometimes you have great sales at conventions, other times you do not. Realize not all value is in sales. There is value in both the experiences of learning what works and what doesn’t and there is even great value in connections you make. There is also a huge value is the new fans you meet who will be excited to see your work in the future, even if they cannot afford to purchase something right this moment. It’s important to take breaks, also during conventions. Otherwise you will tire yourself out horribly and it’ll impact your mood and the experience. Treat yourself and take breaks, you’ll have a better time for it. Fantastic Coraline and Madhatter cosplay. ACEO sketch cards I had for sale for $10 – leftovers can be found in my shop. Meeting Alana is always one of my con highlights. She’s a writer and finds my work very inspiring. An adorable commission Betsy did for one of her repeat customers. I loved this Day of the Dead costume. Jacob, Edgar and I. Jacob and Edgar are such lovely people who are very supportive of both Betsy and I.
I do different hair styles and make up for every day at NYCC – This day was butterfly day. But you’re missing one: Fun meters are a must!